Combine mayonnaise, crab meat, artichoke hearts, Parmesan cheese, onion and parsley in a medium-size mixing bowl and mix well. Divide crab mixture into four portions and spread on half of each tortilla. Top with Cheddar cheese and fold remaining half of tortilla over filling. 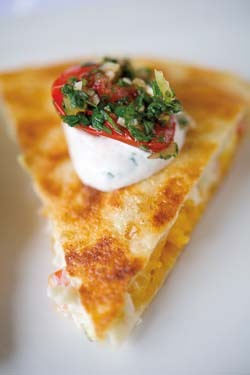 (At this point, quesadilla may be covered and held in refrigerator up to 4 hours until ready to serve.) Heat skillet or griddle over medium heat. Brush skillet with butter; place crab-filled tortilla in skillet and cook 2 minutes or until bottom is golden. Turn and cook second side until golden. Repeat with remaining filled quesadillas. Cut quesadillas into quarters and arrange on plates; top each slice with Charred Tomato Salsa and a dollop of Buttermilk Dressing. Serve hot. Heat skillet over medium-high heat. Place 12 small teardrop tomato halves cut-side-down in skillet and cook until slightly blackened. Toss tomatoes with 1/4 cup finely chopped Serrano chile and 1 tablespoon finely chopped fresh garlic. Stir in 1/4 cup coarsely chopped cilantro, 2 tablespoons aged balsamic vinegar, salt and pepper to taste. Makes about 1 cup salsa. Combine all ingredients in a small bowl and mix well. Refrigerate until ready to serve.